Certified Service experts at Harris Mazda Oil Change are Mazda trained to understand how your Mazda vehicle uses its oil and how it monitors oil life. So an Oil Change from a Mazda-trained technician not only gives you great service, convenience and a great price – it also gives you the added value of our expertise on the particular make and model that you drive. Always consult your Owners Manual for the proper procedure to check your oil level. You’ll get a more accurate dipstick reading by following those instructions. Your Owners manual recommends you check oil level each time you refuel. As temperatures increase, so do the demands made on your vehicle. So make sure your vehicle is up to summer’s challenge. In extreme summer temperatures, you may have to change the grade of your engine oil. Check your owner’s manual for the viscosity grade recommended for your vehicle’s engine. Check the cooling system – both hoses and radiator – for leaks. Check the coolant recovery reservoir under the hood when the engine is cold. Add the coolant recommended in your Owner’s Manual, if required. After a winter of coughing and sneezing, combined with allergens, bacteria, mold and other microscopic interlopers, you might need to replace your cabin air filter and thoroughly clean or vacuum interior surfaces.Winter can take a bigger toll on your vehicle than you think. See your Harris Mazda dealer for a pre-summer springtime check-up. Vehicles with properly maintained engines and emission control systems pollute less and are more fuel efficient. They perform better, last longer, have higher resale value and save you money. 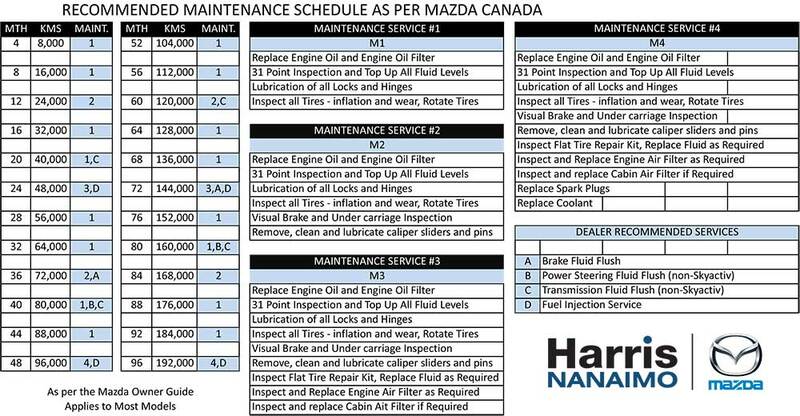 Here are some tips from Harris Mazda Oil Change for keeping your vehicle running at top efficiency. Follow Mazda’s maintenance guidelines to help identify any problems before they become serious. Your Owner’s Manual provides recommended maintenance intervals and product specifications. If you notice a change in the way your vehicle functions or if your fuel efficiency drops, get your vehicle checked promptly. Change your vehicle’s oil at Harris Mazda Oil Change regularly. Your dealership is equipped to properly dispose of waste oil. Change the air filter as often as the manual recommends. Between changes, inspect it by taking the filter out and tapping it against a hard surface. If dirt falls out, replace the filter. Do a tire check-up. Every two weeks, check your tire treads and sidewalls for wear, cuts or bruises. Follow it up by checking your tire pressure. Maintaining the correct tire pressure increases safety, saves you money and reduces pollution. Check your antifreeze/coolant level weekly. Never remove the radiator cap unless the engine is cold! Let Certified Service experts at Harris Mazda Oil Change keep your vehicle tuned up. The fuel efficiency of most cars can be improved by as much as 6 percent with a minor tune-up, saving you money and reducing your vehicle’s carbon footprint. Keep the brakes maintained. Being able to brake quickly can help you avoid an accident. Make sure the vehicle stops smoothly and does not pull to one side when the brakes are applied. *Maintenance needs vary with different uses and driving conditions. See your Owner’s Manual for more information.